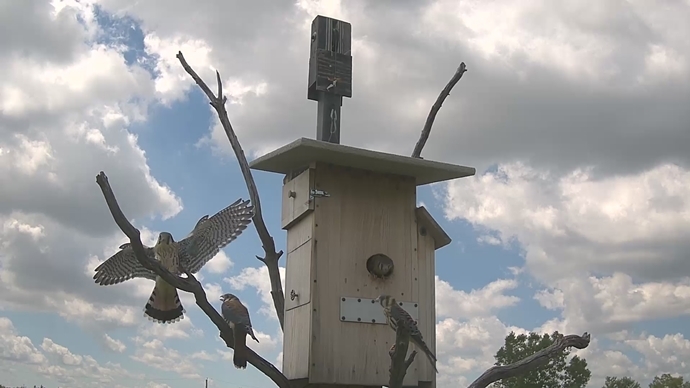 Welcome to the 2015 American Kestrel (Falco sparverius) report and update. 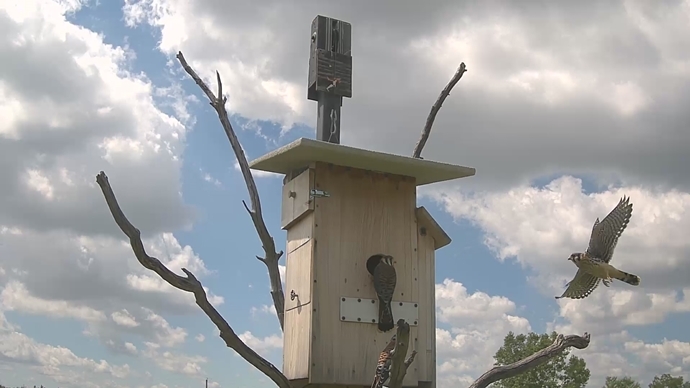 This year we have constructed 2 new nest boxes which give more room for the family to mature and new cameras which work on IP (internet protocol) system. These cameras are 720 p (progressive) which deliver a high quality stream. In 2015 our Kestrels returned on March 31. They have been inspecting both our nest boxes and copulating frequently. We will refer to them as MK. & FK. (MK. male kestrel, FK. female kestrel). If you see the eggs unattended this is common. Full incubation will start when FK. has laid all her eggs (4-5 eggs is common) this is done to keep the hatch close for each egg. Both FK. & MK. will share sitting on their eggs. FK. will do about 90% of the incubation while MK. will pick up the rest. FK. should lay an egg 24-72 hours apart, that’s if she read the book on Kestrels. So far she’s got a good copy of the book. It should take approximately 27-30 days for the eggs to start hatching. 1st egg was laid on May 6/2015 between 11:39am & 1:19pm. 2nd egg was laid on May 8/2015 between 1:20pm & 2:16pm. 3rd egg was laid on May 12/2015 between 10:42am & 12:40pm. 4th egg was laid on May 14/2015 between 10:56am & 5:50pm. On May 8/ 2015 at 8:06am Fk had a visitor to her nest box. Looks like a roof inspection and all was well. Well the date is May 14/2015 and FK seems to be spending most of her time on the 4 eggs. Will there be another egg, or is she in full incubation mode ?? It is very possible for the eggs to start pipping and hatching around June 7/2015 ( piping, the process of breaking open an eggshell using an egg tooth). Make sure you tune in after the eggs have hatched, there will be a lot of commotion. We possibly have some bad news. As of May 15/2015 approximately 11:02am CT we have not seen MK.and FK. was not in the nest box until 7:27pm CT that night and it was brief (4 minutes) then back at 8:43pm. At 10:30pm CT FK. was no longer in the nest box. The next day May 16/2015 only saw FK. briefly and she did not go in the nest box until 8:34pm. FK. stayed the night but did not sit on the eggs. At 6:15am on May 17/2015 FK. leaves nest box returns at 6:55am and again leaves around 8:14am. FK. We did not see her all day and she did not stay in the nest box that night. We have not seen MK. for days. We believe the pair has abandon their nest, there are many reasons they would do this but to pinpoint the exact one is impossible. May 18/2015 no Kestrels seen in the area.